This is an EXPEDITION style run, that is an Out and Back. If you are looking for a trail that results in lots of repairs, this might not be the trip for you. Lots of neat stuff to look at on the way, some of the cabins on the route (except Jackson and the one in Bass Canyon) have been torn down and carted off by the conservo-nazis. It's too bad, you can see pics of them on our first recon. Lots of wildlife, sycamores, and beautiful views though still remain. see if you can find the Natural bridge. 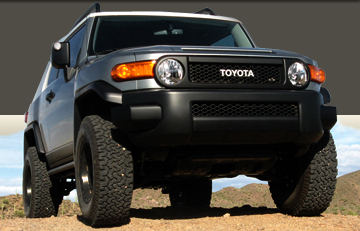 2.5 - Easy 4WD: Moderately demanding trails on which 4WD will be required. You may encounter a wide variety of challenges (Potholes, minor washouts, medium size rocks, and mud holes) on these trails. Higher ground clearance and Off-Road tires are recommended. There are some hill climbs/descents that are best handled with 4x4 Low, but the majority of the trail can be handled in 4Hi. The roughest stuff happens in the last 2-3 miles after the Redfield Canyon Wilderness sign at the top of a large switchback hill, before you encounter the Natural bridge. One last long shelf road descent to the valley floor where the Cabin is, looks intimidating, but it's not hard. You should limit the Rigs to 10,because parking / camping spots are limited at the cabin itself. This is a long run, from the traditional Airdown spot, back to that point is 204 miles. (If you exit via Pomerene/Benson) Longer if you exit via Willcox. 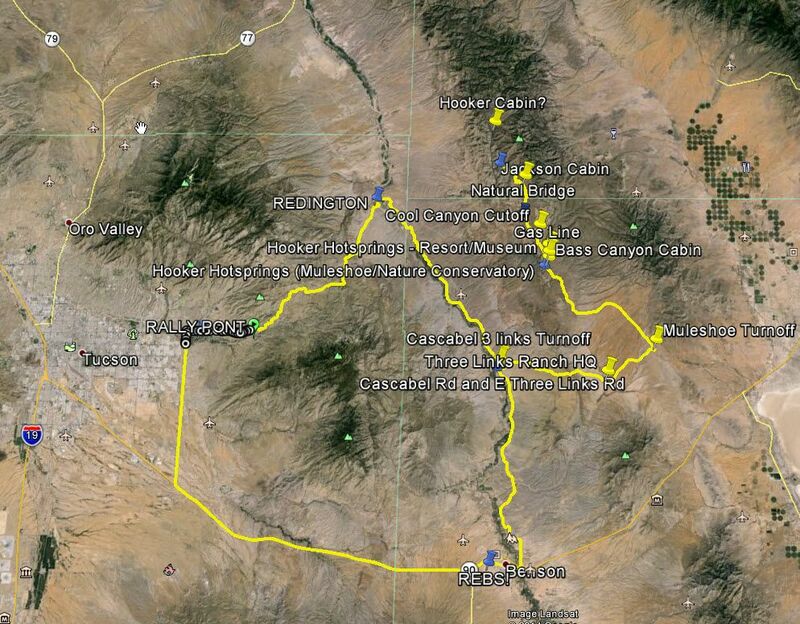 But the actual 4x4 trail itself is only 14 miles. Count on 2 - 3 hours on that part once you get to the trailhead. (Because there are stops and stuff to look at). 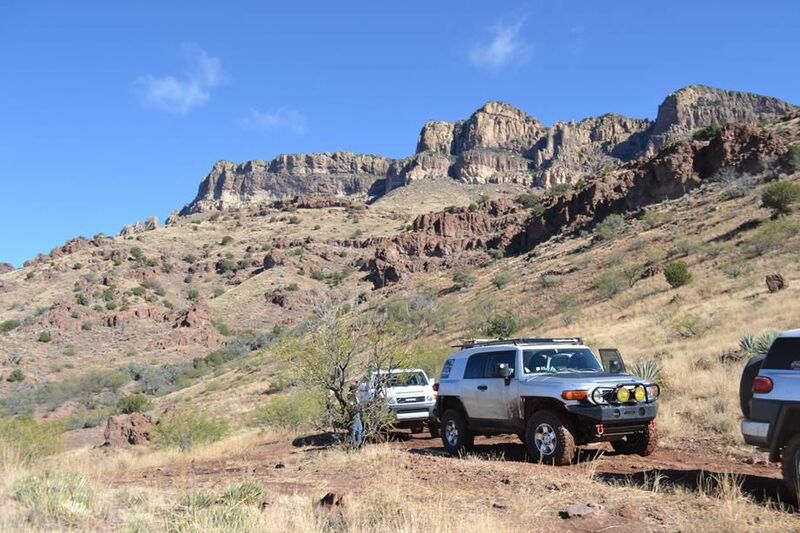 This trail is located on the Muleshoe ranch, Northwest of Willcox AZ, and almost due East of Redington AZ (But you can't access it directly from there). 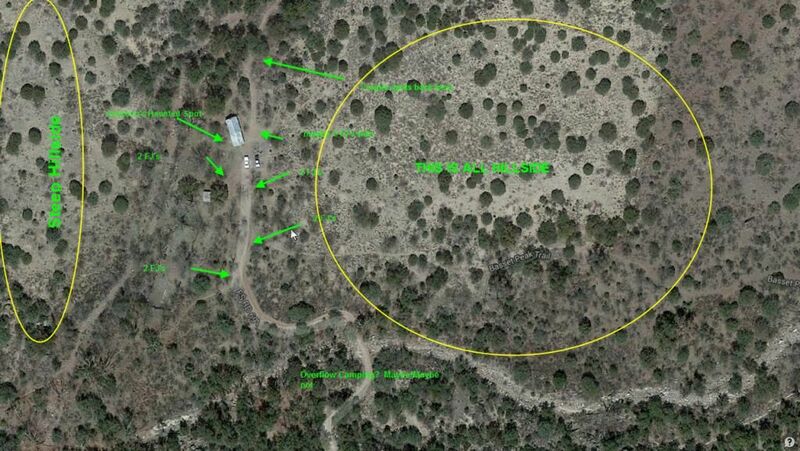 Access is either via Redington Rd from Tucson, or up the Cascabel rd from Benson/Pomerene, to Three Links rd, then a left turn for the 14 mile well maintained road to Muleshoe Ranch HQ, where you must sign in at the Info kiosk. As of December 2014, the Muleshoe Ranch HQ was closed to visitors. Pity, it was a very nice stop that talked about the ecology/history of the ranch and the trail. A sample of some of the stunning beauty that is the Galiuros Mts. I was on this run and while I don't know that I'm experienced enough to judge its rating. I can say there was no point that I felt unsafe. Good placement is important as always. The trail was mostly easy with a few technical spots to keep it interesting. Not a rock crawlers paradise to be sure. But for me it is a great trail with awesome scenery. I would agree with Jimbolios assessment of this trail. Even with rain and mud this run is fairly easy. The trail is wide for the most part until about the last mile before Jackson Cabin. The last mile if the trail narrows but still plenty of room to maneuver a FJ without getting a lot of scratches from the brush.